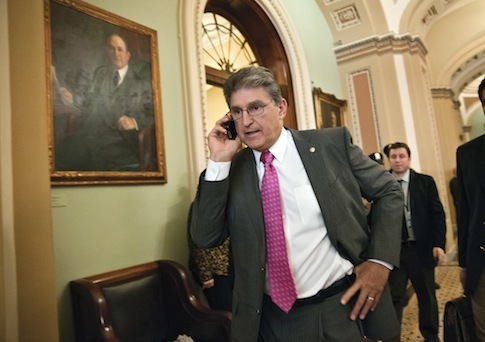 Sen. Joe Manchin (D., W.V.) reiterated Sunday calls to delay the Affordable Care Act’s individual mandate. "Nobody should be forced to buy a policy that costs more than what they had and is inferior to what they had." Manchin said on ABC’s "This Week." "Those things have to be worked out […] The transition period of one year is very reasonable and doable." Ten Senate Democrats are now calling for an extension of the enrollment period. Although Manchin has not signed onto Sen. Jeanne Shaheen’s (D., N.H.) letter calling for the extension, he is currently the only Democrat advocating for a delay of the individual mandate. "I’ve been working in a bipartisan manner with Sen. Johnny Isakson [R., Ga.] and trying to put a coalition together of bipartisan senators, which basically says the penalty the fine of $95 will not be into effect until January 2015," Manchin said. "At that time the fine will be $325. It’ll still induce people to get involved, but it will also give us time to transition in. And I think we need that transition period to work out the things, and we’ve identified a lot of problems a lot of glitches," he said. Many Democrats push back on criticisms saying that the glitches with the rollout should not be extrapolated to the actual legislation. Conservatives say that it is just the beginning of problems. Sen. John Barrasso (R., Wy.) told "This Week" he is not confident the website can be fixed, saying, "The website was supposed to be the easy part of this. So I say actually this is just the tip of the iceberg of problems with bigger problems to come." Consequently, House Republicans called on Health and Human Services (HHS) Secretary Kathleen Sebelius to testify before the House Energy and Commerce Committee, and some lawmakers have called for her resignation. "The president has been poorly served in the implementation of his own signature legislation," Rep. Darrell Issa (R., Calif.), chairman of the House oversight committee, said on CBS’ "Face the Nation." "So if somebody doesn’t leave, and if there isn’t a real restructuring, not just a 60 day somebody come in and try to fix it, then he’s missing the point of ‘Management 101,’ which is these people are to serve him well, and they haven’t." "If [Sebelius]cannot reorganize to get the kind of a team in consistently to meet his agenda, then she shouldn’t be there," Issa said. Last week, Issa’s committee sent letters to HHS and companies involved in Healthcare.gov, threatening to issue subpoenas if they did not receive documents explaining "contracts awarded, communications between the companies and the White House and a detailed list of all meetings related to the launch of Obamacare." This entry was posted in Issues and tagged Darrell Issa, Jeanne Shaheen, Joe Manchin, John Barrasso, Johnny Isakson, Obamacare. Bookmark the permalink.